I am such a fan girl sometimes. 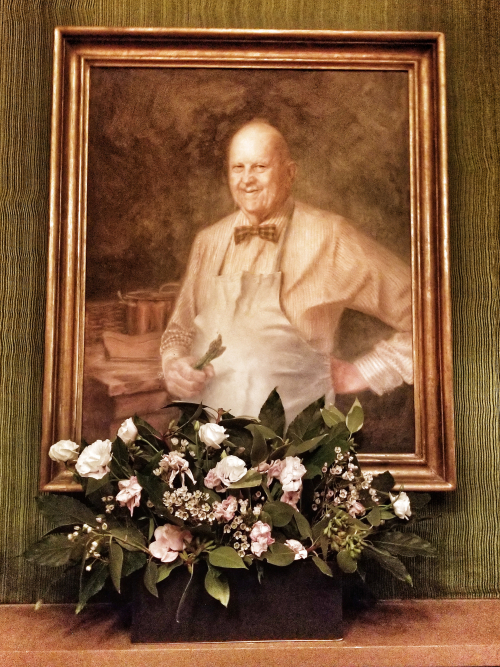 I have always swooned at the notion of visiting the James Beard House for one of their gourmet dinners. Passing by the West Village townhouse I always try to steal a glance through the windows, craning my neck to get a look at the tables inside - jealous of the guests, aching to be one of them. Well, last night I wasn't just a fan girl. I was a dinner guest. And, it was everything it was cracked up to be - from kicking off the evening with a flute of NV Ruinart, Blanc de Blancs, Champagne, Brut and bits of Korean Bacon with Spicy Mustard to Steak Tartare served with addictive crispy beef tendon puffs and glasses of NV R. Geoffroy, Champagne Rose de Saignee Brut. That was just the beginning. The food was courtesy of Cote, the new hot gourmet Korean steakhouse in Flatiron. Let me say, the steak was freakin' sublime. We had a Vertical Tasting of Dry Aged Rib Eye. What is that, you ask? Think about a rosy red slab of seared beef aged for 28 days, next to one that was aged for 55 days, next to one aged for 110 days. Oh, yeah. They brought the funk. They brought the kimchi jam! I could go on, but why make you even more green-eyed with jealousy than necessary? So, fan girl no more, I might need to step up and buy tickets to a few more of these James Beard Foundation dinners. Next time I hope they seat me at the table in James' bedroom, mirrored ceiling and all. I think that'll suit me just fine. 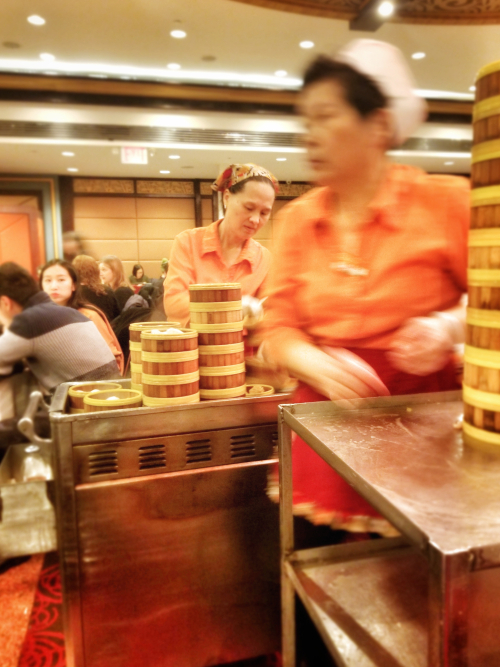 There is something celebratory about hitting one of New York City's dim sum palaces at high noon on a Sunday. The mad crush of people, the clattering of the carts, children darting around the room, the never-ending pots of tea -- all of it contributes to a rollicking good time. 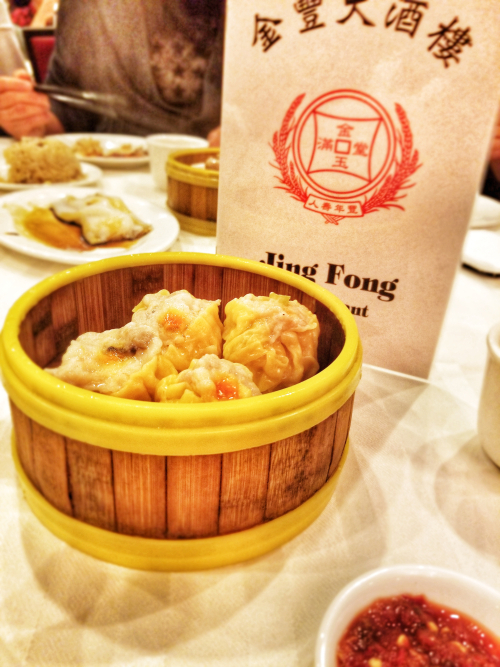 In Manhattan, one of the finest spots for traditional dim sum is Jing Fong. Its massive dining room is a sight to behold -- bright red, decorated with gold flourishes and over-the-top crystal chandeliers, and packed to the gils with Chinese-American families and friends. A few tables here and there host diners who are visiting from neighborhoods other than Chinatown, but this place is seriously popular with locals. It is the real deal. I have a hard time deciding if dim sum is the ultimate New York Sunday brunch or if that award should go the Judaic combo of bagels and smoked fish. Either way, this gal is happy to have either one next Sunday.